Now, maybe I should retract some of my gushing testimonials about Oreana and Owyhee County. Sure, we like visitors, but we really don’t want uninvited people discovering the place and moving in, causing a wave of fanatical tourism and high-rise condo-builders. It’s a place for laid-back, unperturbed folks to live, ones who appreciate what’s around them. So, let’s take a look at the seedy side of Oreana. There’s horrible bugs: biting flies and biting gnats that leave welts all over your body. It can flood down these creeks and wash out bridges. It’s very dry here now, and on top of the canyon you can already see a fire burning in the mountains, and the wildflowers are puny. The weather really is dreadful, just ask me and Steph. I usually think it’s hot, she usually thinks it’s cold. There’s lots of ATV’ers who like to hog all the trails, and there’s SOME PEOPLE who cause danger to themselves and erosion to the landscape by flipping ATVs. There’s defacement of natural boulders and rocks along the Snake River, grafitti artists. When you think about it, this is really a place where you don’t want to spend any time. Although you might be lucky to actually see a rattlesnake, all the snakes I’ve seen this week, (the ones I keep having to touch), are bull snakes (fortunately), though they will curl up as if to strike, like a rattlesnake. I think they don’t enjoy me touching them. The biting flies were bad the week before I got here (especially on the horses’ girths), and the gnats do get bad (for me and horses’ ears), but there’s no bugs at all right now, and maybe it’s just me that reacts badly to bug bites. It floods maybe once every year or two and you might have to rebuild your bridges, but, that’s just a good excuse for practicing engineering construction or tractor driving. It’s very dry here right now. But there’s still a little snow in the mountains, and the creeks are higher than I’ve ever seen them. Steph DOES usually think it’s cold, and I usually DO think it’s hot; it can get very hot and humid and windless, but right now it really is just about perfect, I have to admit. And, there’s so much land here it’s not often horse riders clash with ATVers or motorbikers, but when we do, they’re mostly all great to us riders, many of them slowing down if not turning off their ATVs for us to pass – and that can get tedious if they happen to come across a ride with 60 horses coming at them strung out over many miles! And I think maybe I’m the only one flipping ATVs and I just shouldn’t be riding them. 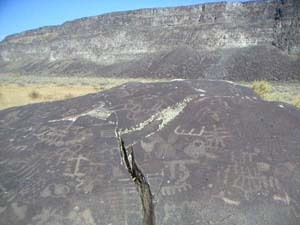 The graffiti artistry along the Snake River that we ride by, (and there are many more sites) is really petroglyphs. (I’ve touched these! So has the Raven!) Nobody knows exactly how old they are, or much about the people who left them, but it is estimated the oldest petroglyphs come from the Early Archaic period (8000 – 6000 BC). Most of them probably date from the Middle Archaic (6000 – 3000 BC) and Late Archaic (3000 – 1000 BC) Periods. 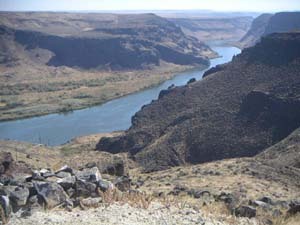 The Snake River Plain is rich in Early Archaic sites, with finds indicating the people fished, and hunted bison, deer, elk, and mountain sheep, and used plants for food and medicine. Housing structures appear to have emerged in the Middle Archaic period. The name Owyhee is a corruption of “Hawaii” – back in the early 1800’s, a large number of Hawaiians were among those exploring and fur-trapping the area around the Snake River. The Owyhee River (which flows into the Snake River) was named after 3 Hawaiian fur-trappers who disappeared in 1819 (the skeleton of one was found a year later). The Equestrian period in this area began around 1750 AD, when many Native American tribes, such as the Shoshone, began using horses probably descended from horses the Spaniards brought with them in the 1500’s, which then spread north through trade. 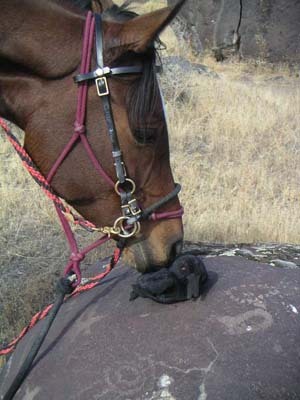 The Lemhi Shoshone selectively bred horses. 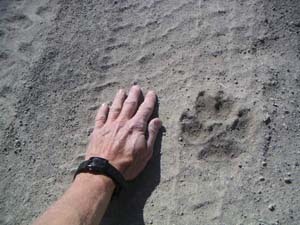 There are horse petroglyphs among the many other carvings. Gold brought waves of settlers out west in the mid-1800’s, and the Oregon Trail was one route they traveled. This southern branch of the trail was shorter but much drier and harder than the main trail. 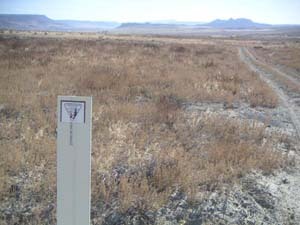 You can still travel over parts of the Oregon Trail now, by jeep or horseback. 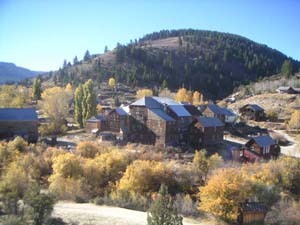 Gold was discovered in the Owyhee Mountains in 1863, and the ghost town of Silver City, some 25 miles away from Oreana by road, is still quite active, with many of the old buildings being restored to their original designs, as it is now on the National Register of Historic Places. 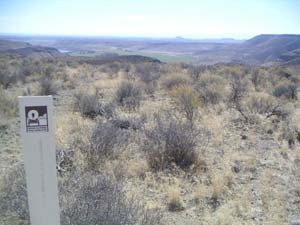 Ridecamp here at home is at 3200’, with Hayden Peak of the Owyhee Front Range 10 miles to the west reaching to 8403’. It’s old cattle country – the first and biggest cattle drive came to Owhyee from Texas in 1869. 100,000 cattle roamed the area at its peak; ranching is still a major way of life here. If you’re here in October, you’ll see the cows beginning to come down out of the mountains, heading home – the old cows who’ve been doing it for years leading the way for the younger ones, with no cowboys herding them. They instinctively know when it’s time to head home, for an easier winter where hay is thrown out for them. The headquarters of the JR Simplot Land and Livestock company is just down the road in Grandview. Do potatoes ring a bell when you hear Simplot? They’re also one of the world’s largest frozen-potato processors. If you come here to visit or squat, (now, I didn’t say move here! ), you might come across big horn sheep, deer, antelope, badgers, spotted skunks (one came in the house once when I was housesitting! ), horny toads, ravens (3 that fell out of a nest last year were raised by a neighbor; 1 survived and still hangs around - more on that later! ), hawks, lots of screech owls, great horned owls, coyotes, possible wolves (I’m pretty sure I saw a black one 2 years ago, and afterward heard tale of other black wolf sightings), and rumors of cougars (tracks were seen by riders a few years ago).